I know so many of you found my work and blog via this beloved, very longterm project of mine. My Medallion Quilt today feels like an opus. Worked slowly over several years, each row brought me to a new understanding of the medium, tradition, and community of quilts. I love this quilt. I loved making it, and I definitely cried when it was finished—lost without something to do with my hands for several weeks. Believe it or not, my first forays into quilting were done completely by hand, and by the time my mom bought me a sewing machine as a graduation gift it was already very clear that I would be stitching for years to come. I'm thrilled to have the opportunity to share my Medallion Quilt publicly at Art in the Age in Philadelphia, PA as part of my show Handwork which will be on display from February 7th through March 31st. If you'll be in Philadelphia next Friday, February 7th, I hope you will join us for the opening reception from 6 p.m. - 8 p.m.
Over labor day weekend in September 2010, I started my Medallion Quilt. It took me over 3 years to hand piece and hand quilt this 90"x90" explosion of print and color, and in October 2013 it was by far the largest quilt I had ever made—even larger than any of the machine sewn quilts I had made. It wasn't exactly my own idea to start this quilt and do it completely by hand, I was completely captivated by the quilt movinghands was stitching by hand as part of a quilt along started by the incredible Anita of Blooming Workshop. 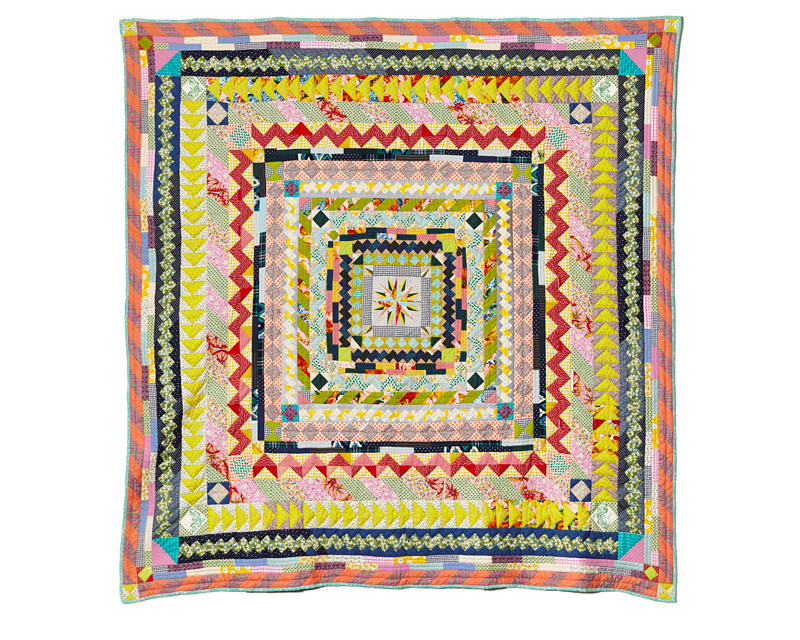 Both quilters had been inspired by this captivating quilt created in 1890. It just seemed like a fun little project to give a try, so I started stitching not actually imagining that I would finish. Slowly savoring each stitch of this project brought me a unique intimacy with my materials, and a cacophony of new techniques. 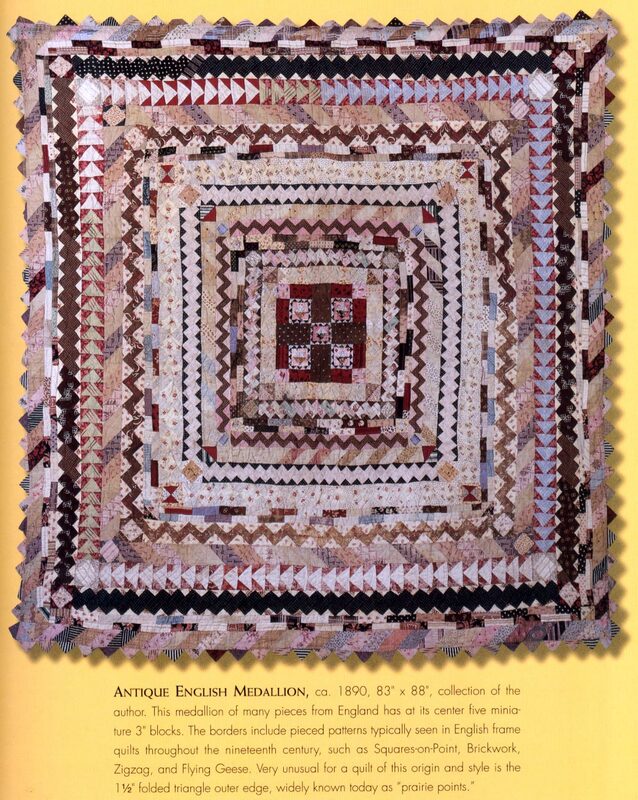 All the while a wonderful group of strangers (some quilters, some not) around the world started cheering me on, and with their encouragement I found plenty of time to contemplate the many stitches of the woman who completed the original quilt in 1890. I now feel such a deep respect for the legacy and community of quilting, fibers, and craft. My stitches are the same stitches ca. 1890, and the same as those of my fellow medallion quilt-along friends, and the same as those who try their own hand at a medallion quilt. It was such a powerful feeling to find that this wasn't just a union of cloth, but a union with other makers in times and places not my own. Photo courtesy of Marko Metzinger.